Using platitudes like “remarkable” and “dazzling” in flap copy is forgivable, but calling a book “funny” when it is anything but is a much worse crime. Flap copy always lies. It’s sickly understandable, considering the competitive marketplace for books. But, as a reader, it’s intensely frustrating to wade through book descriptions where the truth is more fungible than on James Frey’s resume. I love funny books, as does the world: George Saunders won a MacArthur “Genius Grant,” Amy Hempel won a Guggenheim, and David Sedaris could sell books of filled-out crossword puzzles. People like to laugh. The difference between me and a book publisher is that I define “funny books” as “books that are funny.” Publishers, or at least their flap copy writers, do not. Of course, there’s no accounting for taste and no guarantee of talent; I’m not talking about books that try to be funny and fail. For instance, last year’s The Sheriff of Yrnameer (Pantheon, 2010), written by former Daily Show writer Michael Rubens and inspired by (i.e. nearly plagiarizing) Douglas Adams’s Hitchhiker’s Guide series. I found Yrnameer painfully difficult to read, one of the top ten most memorably bad novels I’ve ever read. But it was at least trying to get laughs, and when its flap copy calls it “raucously funny,” it’s only a lie of inches. At least I can prepare myself for the particular disappointments an unfunny comic novel might bring. 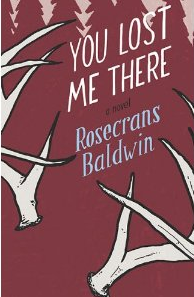 In fact, You Lost Me There is a wrenching novel about a loving man who realizes his failures as a husband only after his wife’s death in a car crash. It’s a well-written portrayal of a man’s powerless regret. But it’s definitely not funny. If they’d cut “funny,” and left “charming and tragic,” they might have performed a coward’s end-run around the question of humor, but You Lost Me There would more accurately be called pathetic, in the sense of inspiring pathos. Certainly I can understand the decision not to call a novel “pathetic.” “By turns pathetic and tragic” doesn’t have the same ring. But fleeing to the opposite end of the spectrum and lying to potential readers…this smacks of positioning to me. It feels like goons in suits tracking spreadsheets and seeing that a debut novel called “funny” will sell X more copies. It’s not that simple, of course, nor do I think publishers are quite that ghoulish. But there’s more than a little fear at play here. 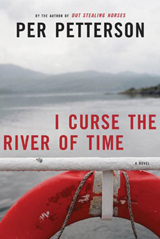 Per Petterson’s latest novel, I Curse the River of Time (Graywolf, 2010) also got painted with the funny brush. Its jacket reads, “an honest, heartbreaking yet humorous portrayal of a complicated mother-son relationship.” Humorous, is it? It’s a novel about a depressed man whose wife is divorcing him and whose mother is dying. As for that “complicated mother-son relationship”: she hates him because he’s a Communist and took a job at a factory instead of going to college. She thought it was a stupid decision. She was right. There might have been some jokes told in the factory where these books were printed, but both are far from “funny.” More importantly, neither try to be funny, and calling them such misses the point of their stories, the equivalent of a restaurant describing their dishes by detailing the history of the china they use. Certainly, I appreciate the stupefying, thankless work of the flap copy writer. I work at an independent bookstore. Each month I write capsule descriptions of ten new featured books — forty words each. That’s a sum total of 400 words per month, and still, soon enough they begin to sound the same (I’ve have to cut the phrase “outstanding prose” more often than I care to admit). However, I don’t try to position books — I don’t skew descriptions to sell more copies, just like when a friend asks me for a recommendation, I don’t grab the nearest book and bellow, “THIS WAS DAZZLING.” I try to find a book that specific person will like. When I write those capsule descriptions, I do it with the intention of accuracy, in an attempt to match the right book with the right person. If we were selling chocolate instead of books, using a platitude like “remarkable” would like saying all your chocolate was “delicious,” which is misleading but defensible. Calling a book “funny” when it is a wrenchingly tragic exploration of regret and misery, that’s like claiming a chocolate bar is filled with caramel, when it might actually contain nougat, or almonds, or little shards of metal. Certainly, that technique will move the metal-shard candy, but over the long run, it’s bad for business. Bezos responded, “We don’t make money when we sell things, we make money when we help people make purchase decisions,” and left the negative reviews up. It’s a telling detail that, even with something as inconsequential as negative Amazon reviews, publishers squirm to admit any kind of weakness. The real weakness is that lying flap copy, which betrays an attitude of selfishness. Every time someone reads You Lost Me There expecting a funny story, that publisher is eroding trust. However, that publisher also sold another copy. The real reason publishers lie on their flap copy is simple: it works. I would never have bought You Lost Me There if it hadn’t said funny. And, while I enjoyed it, I can’t say the same for I Curse the River of Time, also an atmospheric exploration of misery, also called “funny” on its flap, also nothing of the kind. To paraphrase Bezos, publishers would make more money if they helped people find books they like — the problem is that individual books sell more copies when they let the salesmen write the copy. Nico Vreeland is a bookseller at Trident Booksellers in Boston. 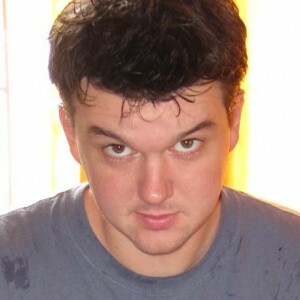 He is a graduate of the Emerson MFA program and a founding editor of the books website ChamberFour.com. DISCUSS: Are Author Blurbs a Waste of Space?